Thrissur, located in the wide landscapes of Kerala state is greatly famous for its magnificent temples. The place is dotted with many archeological buildings and monuments making it a must visit destination on an expedition of Kerala. The prime monuments to visit in Thrissur comprises of the Archaeological Museum, Cranganore Fort and Shakthan Thampuran Palace etc. 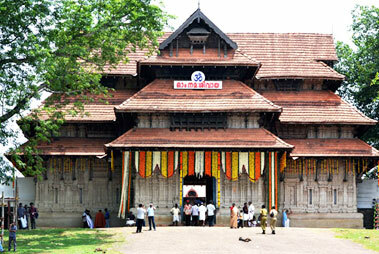 Thrissur derived its name from ‘Tiru-Shiva-Perur’ and is popular for being the center of culture and literature. This majestic ancient town is built around a hillock top. The district of Thrissur is renowned worldwide for the magnificent festival of Pooram. The nearest airport to reach Thrissur is Nedumbassery International Airport located in Kochi. This international airport lies at a convenient distance of 85 km. The airport is well connected to all the prime airports of India and even with some of major foreign cities. Frequent direct flights are available to cities like Mumbai, Bangalore, Delhi and Chennai. Those who wish to reach Thrissur by rail route will not be disappointed as Thrissur lies on a major railhead route of Southern Railway. Frequent trains operate between Thirssur and all the prime cities of India. One can also reach this ultimate tourist destination by enjoying a road route. A large number of buses are available to board from all cities in Kerala to Thrissur. Kerala State Road Transport Corporation buses connect Thrissur with other cities. A large number of private bus services are available to board which provides for easy travel inside the city. Enjoy traveling through the super deluxe buses which ply frequently between Thrissur and other important cities like Bangalore, Kozhikode, Salem, Palaghat, Coimbatore, Chennai, Trivandrum. Address: Nattika Beach Ayurveda Resort Nattika Beach P.O, Nattika, Thrissur Kerala -680566 India.